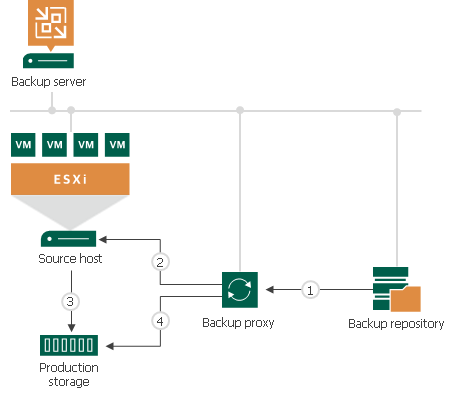 The backup proxy sends a request to the ESX(i) host in the source site to restore data to a necessary datastore. The ESX(i) host in the source site allocates space on the datastore. Data blocks are written to the datastore. When thick disks are restored, the ESX(i) host allocates space on disk before writing VM data. When thin disks are restored, the ESX(i) host attempts to allocate space on the fly, as requests for data blocks restore are received. As a result, restore of thin disks involves extra allocation overhead if compared to restore of thick disks, which results in decreased performance. To restore VMs with thin disks, you can use the Virtual appliance mode or the Network mode. If you plan to process a VM that has both thin and thick disks, you can select the Direct SAN access transport mode and choose to failover to the Network mode if SAN becomes inaccessible. In this case, Veeam Backup & Replication will use the Direct SAN access transport mode to restore thick disks and the Network transport mode to restore thin disks. Alternatively, you can restore all VM disks as thick.